Lil p and Mom putting the star and diya rangoli. Lil P filled in the colors herself. The faraal breakfast- kodbole, chakli, chivda, Shev, besan ladoo, chirote, rava idli , aloo sagu, chatni, shankarpali, chavda… 🙂 hehe. Momz here this time around. The closeup of star rangoli and diya rangoli. Happy Diwali !! Nice photos !! Happy diwali to and to your loved ones.Special wishes to lil p.
Happy Diwali to you and your loved ones.. All the pictures are simply amazing!! Happy Diwali Shruti. Lovely lovely rangoli, the one at the doorstep. Awesome colour combination. @Rekha: Linked. 🙂 Nothing beats mom made food. @varunavi’s : Yup. Link the pics of the colored diyas. @Arundhati: 🙂 Thank you. and a happy diwali to ur lil P too. @patty: U r very generous with words. Happy Diwali to u n ur family too. @Shankari: passed on the wishes to mom. 🙂 happy diwali to u too. @MiM: Hehe. Happy Diwali. Hows ur finger now? @Sg: Thank you for the wishes SG 🙂 Hope u had a great time too. Do you use the colors directly without mixing it with white kolamavu??? Wowww! The first rangoli – I thot it ws a ready-made one! So perfect! 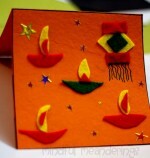 Wishing all of u a very happy Diwali Shruti. How is LilP now? AWESOME Rangoli! Now I know where your creative genes come from! Happy Diwali btw, albeit a tad late. @Ani: Yup. Esp during festivals. @Emreen: Yes. Thanks for dropping by. 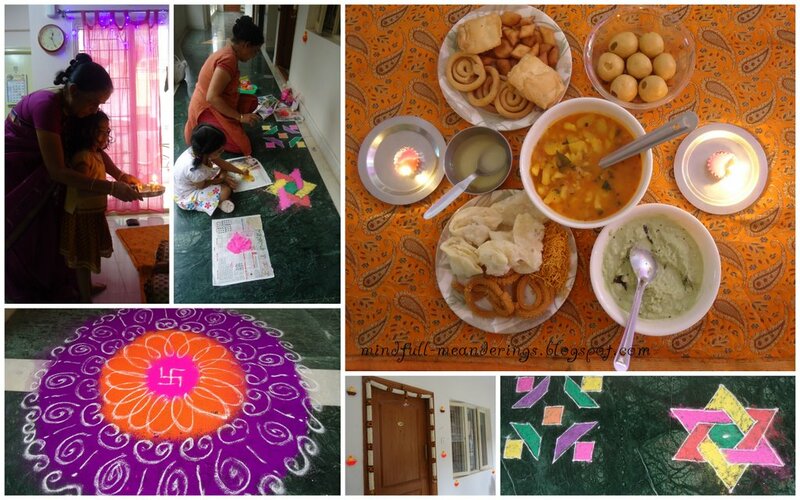 @Swaram: I put the circular colors using a seive and mom put the white rangoli. Both me n lil p have severe cold n cough. Wow.. Beautiful rangoli and yummy sweets!!! Happy Diwali!! Wish you a very happy diwali too! the rangoli looks awesome! such a lovely Rangoli. Obviously the creative gene runs in the family 🙂 Happy Diwali to you all! Wow! Lovely pics :)So nice to see G’ma with LilP..n the rangoli is beautiful! Just love love love that rangoli! Such vibrant colours and what an interesting colour combination. @purplehomes 🙂 Thank u. passed on all the compliments to aayi. @Bubble catcher.. The rangoli colors these days are too fine almost like gulaal. Only this style of rangoli works.